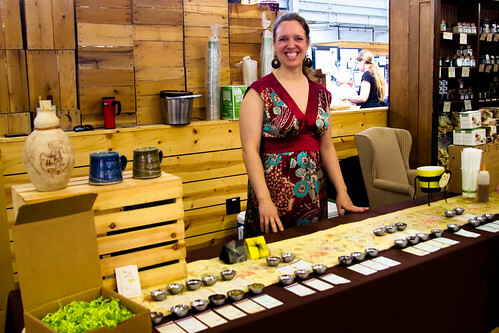 I happened to discover Tupelo Honey Teas at the Pittsburgh Public Market the first Saturday in April. I had heard of Tupleo Honey Teas before, but by the time I became a frequent visitor at the Market, it no longer had a booth there. 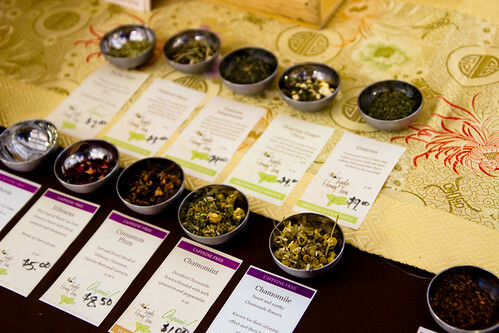 (Currently, Tupelo Honey Teas is back at the Market on the first Saturdays of each month until September, and is always available online.) 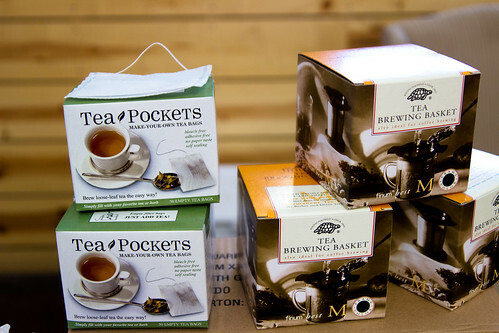 I love tea, so the two or so dozen varieties of tea definitely caught my attention! I tried the Black and Gold tea that owner Danielle Spinola brewed and brought with her that day - a special blend dedicated to our Steelers. It is Danielle's own creation by blending black tea with ginger and cinnamon, and it is great! 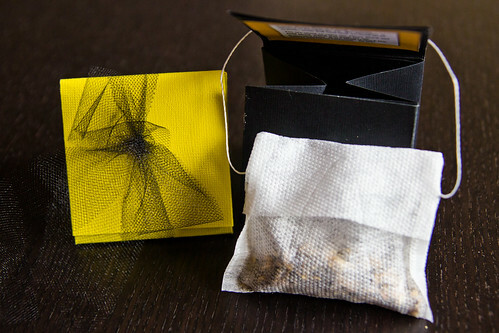 At that time, I also happened to be shopping for favor of sorts for my wedding that would feature Pittsburgh (more on that in a later post), and thought Tupelo Honey Teas' Black and Gold teabags would be just perfect! 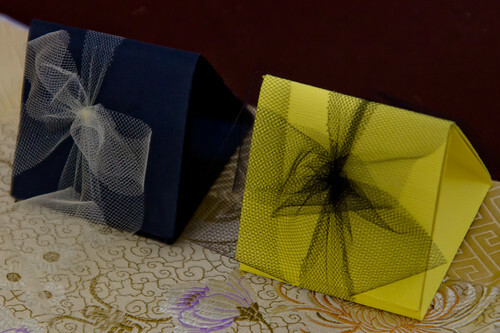 Danielle teamed up with local artist Leatrice Krivyanski (of KreativLea) who made these cute favor boxes for the teabags. I asked for black and gold, of course, but these can be made in any color. Danielle can also make custom labels for the favors. My main goal was to feature local small businesses in Pittsburgh, so I had asked Danielle to include a little blurb about her company, which you can just barely see in the photo above, taped to the inside flap of the favor box. I was in Cleveland on Saturday and took the opportunity to finally check out Lola with my future mother-in-law as an early Mother's Day celebration. 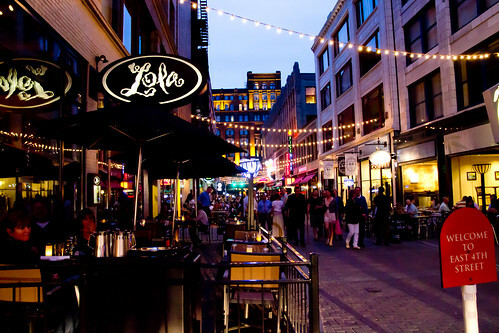 Lola is located at the end of a vibrant stretch of East 4th Street in Downtown Cleveland that is pedestrian-only and patio-friendly. Inside, Lola is quite spacious, with the lighting kept dim. We had a seat with a view of the open kitchen; the chefs were clearly busy on this weekend night, but if they were at all stressed, they did not give it away. We were actually quite amazed by their composure and tranquility as they prepared food for a full house. The menu at Lola is not particularly large, but everything sounded so amazing that it took us probably more than 10 minutes to finally come to a decision on what to order. 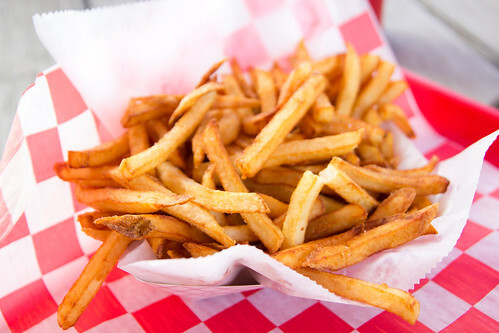 I am not allergic to gluten, but those who are would be pleased to learn that Lola offers plenty of gluten-free options. 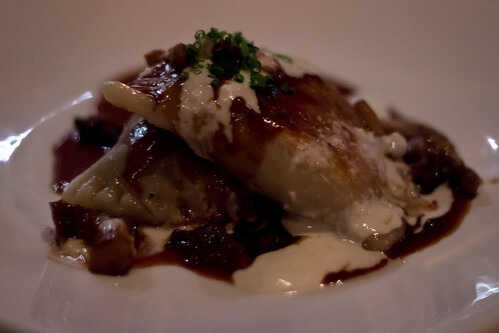 I settled on the Beef Cheek Pierogi with wild mushrooms and horseradish crème fraîche for an appetizer, which was exquisite. I thought the horseradish crème fraîche was brilliant. 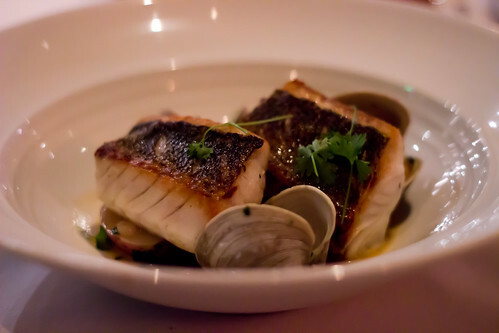 For my entree, I had the Walleye, with ramps, redskin potatoes, clams, and an herb shellfish broth. The fish was perfectly tender, and the sides complemented it well. Future mom-in-law loved her Artichoke Soup, a special of the evening, and her Wild Pacific Salmon entree. Finally, I just couldn't resist a dessert that features maple bacon ice cream! 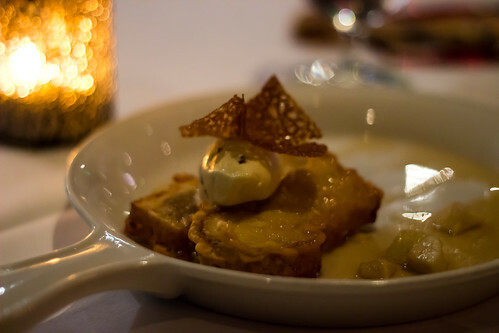 The 6 a.m. Special also came with brioche French toast and caramelized apple. The ice cream had a subtle maple flavor with bacon bits throughout, which went very well with the rest of the dessert. The service was top-notch as well. Our server, Mark, was attentive, professional, and helpful. Even though it was a Saturday night, and I knew Lola was fully booked, there was not a moment when I felt rushed. Au contraire, I felt as though Mark was giving us the space and time to savor our meal in a leisurely way. All I can say is, if you wish to score big brownie points with your mother-in-law, take her to Lola. But be sure to book EARLY - as in at-least-three-weeks-in-advance early - if you're looking to go on a weekend. Lola is wildly popular, and now I understand why. I had been pretty excited about Station Street Hot Dogs since the day it reopened under the new ownership of the Sousa brothers. A good friend I will lovingly refer to as "Hot Dog Fiend" and I had been talking about going for ages, and we finally made it out there a couple weeks ago. Station Street is located a bit off the beaten path, behind the new Target in East Liberty. We were both surprised by the sizable and bright indoor space, and there are a few outdoor picnic tables as well that are perfect for the warmer weather. I had examined the menu online when Station Street first opened, and had been looking forward to trying the Sweet Bread Dog. Unfortunately, it has since been taken off the menu (for the time being anyway), so I went for the next best thing: Banh Mi Dog. 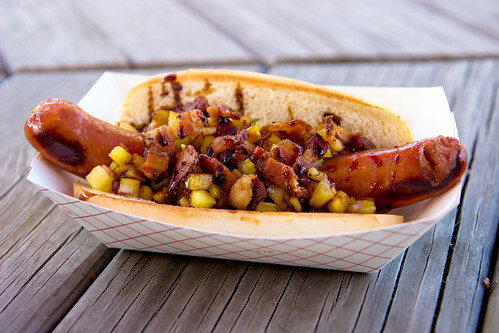 I also wanted to try a second variety, and after some internal debating I settled on the Hawaii Dog. Both were delicious and satisfying. The combinations of the flavors worked out well. 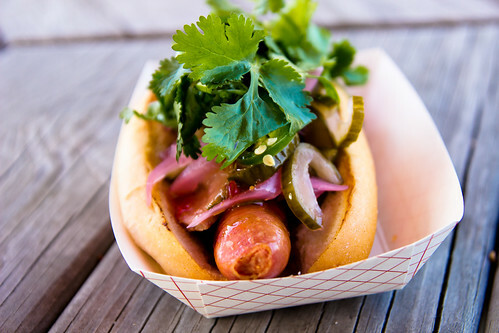 I think it is definitely true that the toppings are what made these hot dogs great. The frank itself isn't bad, but I personally prefer the locavore at Franktuary. Hot Dog Fiend had only good things to say about her Chili Cheese Dog, and she was nice enough to share her fries. Needless to say, we enjoyed our visit to Station Street. Hope to come back and try some other dogs soon! I happened upon this Thai Red Curry Turkey Meatballs recipe in The Perfect Pantry blog a little while ago and immediately knew I had to try making it myself! I think they turned out quite good. The only mistake I made was overseasoning the meatballs! The recipe had stated that ground turkey tends to be bland, so I did not hold back. Turns out I should have heeded the advice to use just half of seasoning and add more after tasting. 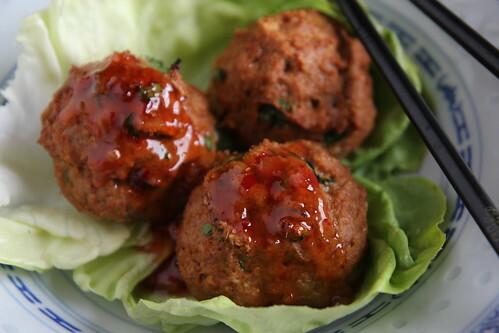 These meatballs had a particularly strong curry flavor, and they were spicy too, even though I didn't expect them to be. I might have to use a little less curry paste next time along with less salt. Still, I was quite happy with them. I paired the meatballs with a simple curry rice (just jasmine rice with Madras curry powder and raisins added before cooking) and it was delicious. We were in Cleveland a couple of weeks ago and needed a place to go for dinner. A Google search took me to this Restaurant A-List so I thought we might check out a place from it. 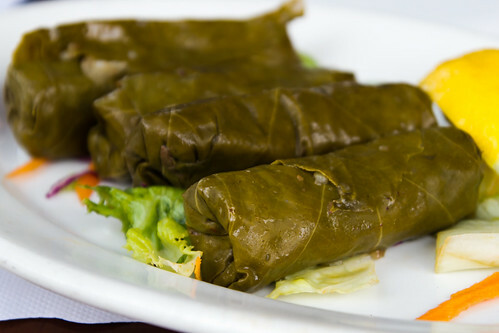 Anatolia Cafe in Cleveland Heights seemed interesting, not too far from where we were going to be, and offers plenty of vegetarian options, so that's where we ended up. 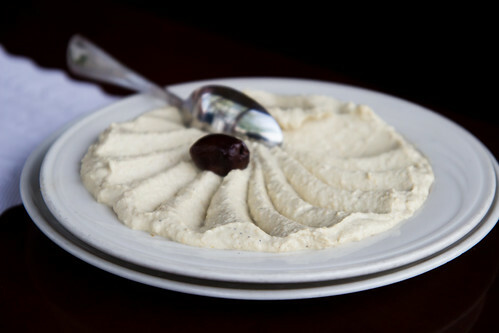 Anatolia Cafe has a nice outdoor patio, while the interior is bright and spacious. We sat at a lovely table inside by the window. The carnivore in me was very excited by the menu choices. 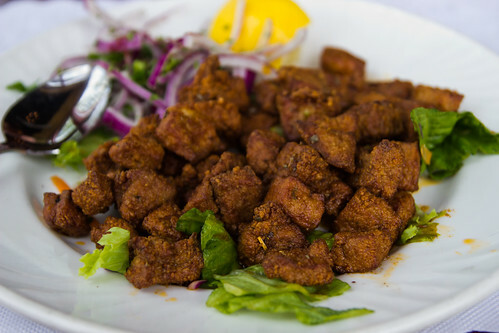 I started with the Sautéed Liver Cubes appetizer, made with veal liver, which was well seasoned and flavorful. 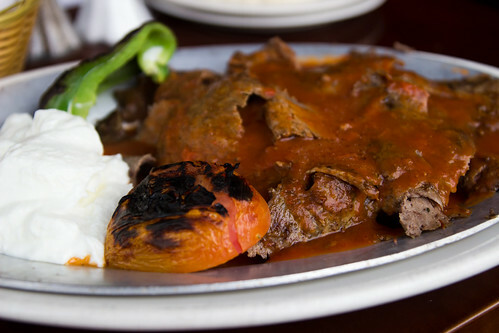 For the entree, R. and I shared the Iskender, a menu-proclaimed "must try" dish of döner (shavarma) with pan sautéed pita-croutons, tomato butter sauce, and fresh yogurt - also very tasty. 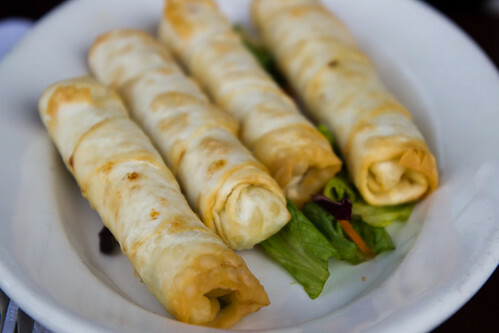 I also tried some of what R. and his mom had ordered, which were a combination of different appetizers. They were all quite good. All in all, it was a nice meal. R.'s mom insisted on treating us since R.'s birthday was coming up, which was very nice of her. My only complaint is that there were a lot of flies even in the indoor space - I'm not sure if that was an anomaly and what can be done about it, as I understand that insects get inside easily when doors are kept open, but I do think it deterred a bit from the experience that was otherwise pleasant.